Please bring your completed paperwork if you have not completed the required forms on the patient portal. Plan to present a photo ID and your insurance card; please prepare to pay any applicable co-pays, coinsurance or deductibles prior to being seen. We take most major credit/debit cards, checks, money orders and cash. What time should I arrive to my first appointment? You should arrive approximately 15 minutes before your appointment time. Please arrive 30 min prior only IF no new patient paperwork has been completed via the patient portal or by paper. Will my health insurance cover my visit? While preventative care visits are typically covered fully, some require a co-pay. If in doubt of whether a procedure or service is covered or not, please contact your insurance company or our billing department prior to your visit. Will there be a co-pay? Depending on your insurance company, some visits and services require a co-pay and some plans are deductible. Co pays, coinsurance and / or deductibles are collected prior to being seen. When should I have my first gynecological exam or Pap smear? Generally, women should schedule their first exam when they turn 21 or when they first become sexually active. However, they can come sooner if they have any gynecological concerns. Can I have a Pap smear on my period? Yes, however it is recommended to avoid if at all possible. The blood may cover up the cells, which need to be examined. Try to schedule your Pap test when you are off your period or when you do not have a heavy flow. Women with a healthy, normal immune system between the ages of 21 and 29 need a Pap smear every two years. Between the ages of 30 and 64, a Pap test should be given every three to five years based on the patient’s HPV status and past medical history. 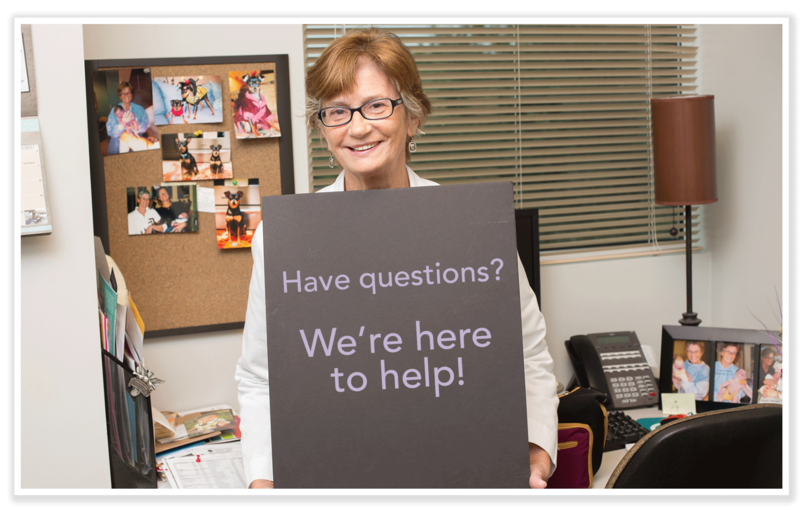 After 65 you may not need a Pap test anymore. Women with certain medical conditions or who are pregnant may require additional Pap testing. Birth control pills should be taken at the same time every day. If you realize that you have forgotten to take your pill that day, take it as soon as possible. If you do not realize until the next day, take two pills at your normal time. Birth control loses its effect when it is not taken every day, it is recommended to use a backup form of contraception after missing a day. Starting at age 30, women should have an HPV test along with their Pap test. Some home pregnancy test can detect a pregnancy as early as a few days before your missed period. However, for the most accurate results, you should wait until a day after your missed period. When Should I Make My First Prenatal Appointment? If you believe you are pregnant, you should schedule an appointment to confirm at once. Your first prenatal appointment should be within six to eight weeks after your last menstrual cycle. You can schedule your appointment online or by calling (941) 254-2717. Our practice policy requires all obstetrical patients to be seen by all of our providers during the prenatal visits, this allows you to be familiar with all our providers and at the time of your delivery the doctor or midwife who is on call the day you go into labor will be the one to perform the delivery. If you already have a regular exercise program, you may continue your exercise routine if approved by our medical staff. You should not start a strenuous workout regimen and stay away from activities with high risk of falling or injury. Remember to always be hydrated during your workout. If you have a healthy pregnancy, you may travel up to 36 weeks of pregnancy. It will be highly recommended that you have a copy of your pregnancy medical record in the event of a medical emergency. Can I drink caffeine while pregnant? Caffeine intake should be limited during pregnancy. Do not drink more than 200 mg a day (around two cups of coffee). Is there anything I should avoid eating during my pregnancy? Yes. You should avoid eating foods that can be contaminated with listeria, mercury and toxoplasmosis such as unpasteurized cheeses, raw fish, undercooked meats and deli meats.